Continuing to move forward with customers and society to transform our corporate structure to one that can generate stable profits. The HCM Group launched a new mid-term management plan, “CONNECT TOGETHER 2019,” in April 2017. We are promoting the development of “Solution Linkage” utilizing ICT and IoT to offer solutions to customer’s challenges on “safety,” “productivity,” and “life-cycle costs.” And, to expand the source of revenue besides new machine sales, we are expanding the value chain by enhancing the parts and service business for mining machines and facilities provided by H-E Parts and Bradken, HCM’s consolidated subsidiary we acquired in the previous fiscal year. 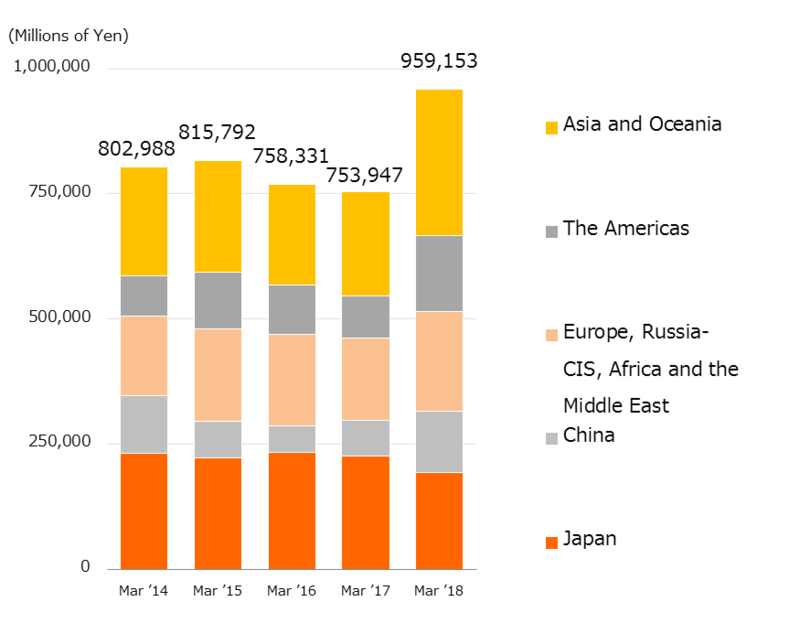 Additionally, we are working to secure profit by establishing a global management support scheme, the expansion of its market share, cost reduction, and enhancement of operational efficiency. 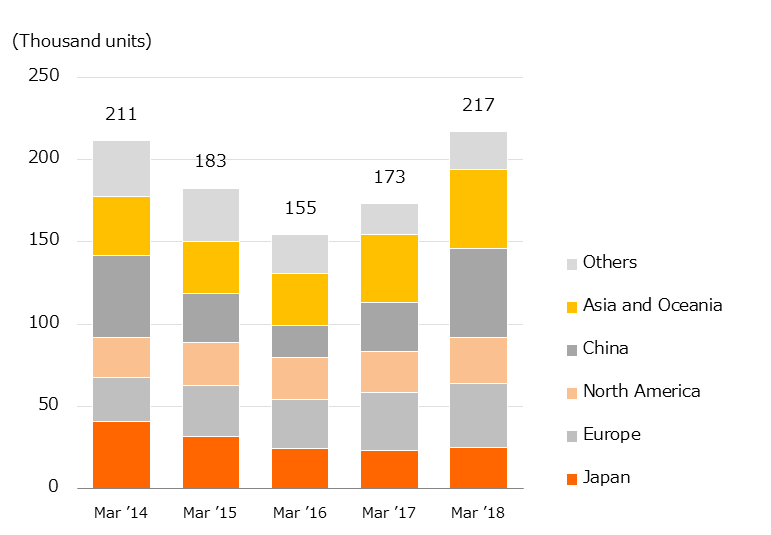 Consolidated revenue for this term (April 1, 2017 to March 31, 2018) increased by 27.2% year on year to ¥959,153 million due to increased sales mainly in China and the consolidation of H-E Parts and Bradken, while we saw a negative impact of the stock transfer of Hitachi Sumitomo Heavy Industries Construction Crane Co., Ltd., which became an equity-method affiliate of HCM on March 31, 2017. 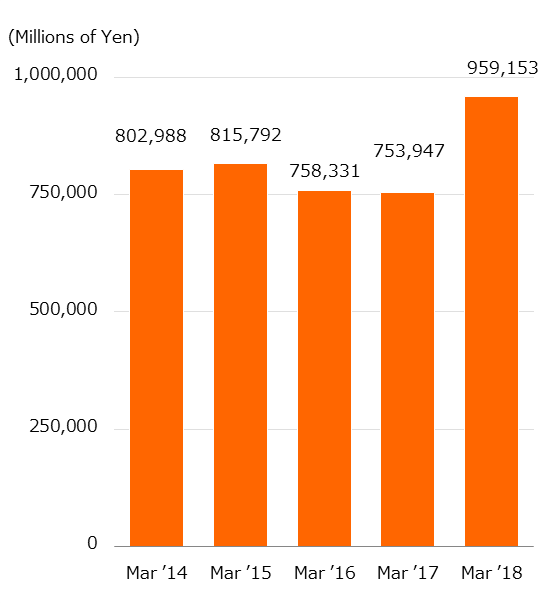 Adjusted operating income increased by 231.1% year on year to ¥93,582 million, operating income increased by 305.3% to ¥95,737 million, and net income attributable to the owners of the parent increased by 648.0% to ¥60,004 million due to a decrease in the cost of sales and SGA, in addition to the contribution of the solution business and parts & service business. Business results by segment are described below. 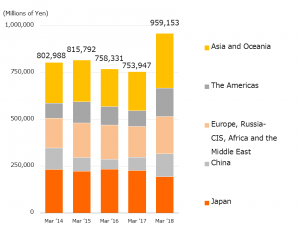 Demand for hydraulic excavators increased globally year on year except in the Middle East. We promoted enhancement of the parts and service business through a globally launched service solution called “ConSite,” as well as expansion of the parts supply network to enlarge sales and revenue. The newly launched “ConSite OIL” in October in Europe and Australia, is the first service in the industry to predict problems of engines and hydraulic equipment by remotely inspecting the condition of its oil by oil sensors installed in each machine. In Japan, for i-Construction promoted by the Ministry of Land, Infrastructure, Transport and Tourism, the HCM Group has been working to promote smart construction by providing its workshop to customers at an ICT demonstration site that we established in Hitachi-Naka City of Ibaraki Prefecture and by offering solutions for an efficient construction process. 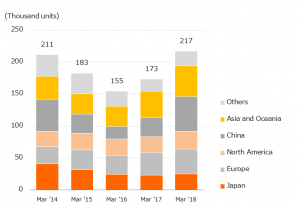 As for mining machinery, demand significantly grew year on year by the increased CAPEX of mining companies. We are focusing on expanding sales of the well-accepted AC-3 series rigid dump trucks equipped with an advanced vehicle body stability-assist function, in addition to offering a fleet management system and developing an autonomous haulage system to optimize mining operations, by taking advantage of Hitachi Group’s strengths. Furthermore, we have been working to establish a highly controlled customer support system to enlarge revenue from parts and services. 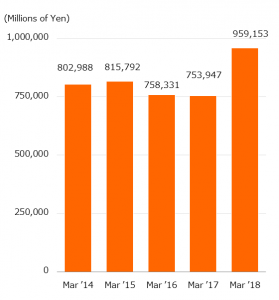 Consolidated revenue of the construction machinery business for this term (April 1, 2017 to March 31, 2018) increased by 16.0% year on year to ¥866,866 million, and adjusted operating income increased by 227.8% to ¥91,157 million. This segment consists of H-E Parts and Bradken. H-E Parts mainly provides services and solutions required for machinery and equipment for mining. Bradken supplies wear parts for fixed mining plants and mobile mining equipment, and also provides maintenance and servicing for them. Consolidated revenue of the solution business for this term (April 1, 2017 to March 31, 2018) was ¥92,638 million, and adjusted operating income was ¥2,425 million because of the steady contribution to its revenue from solutions for mining machines in Australia and Latin America. 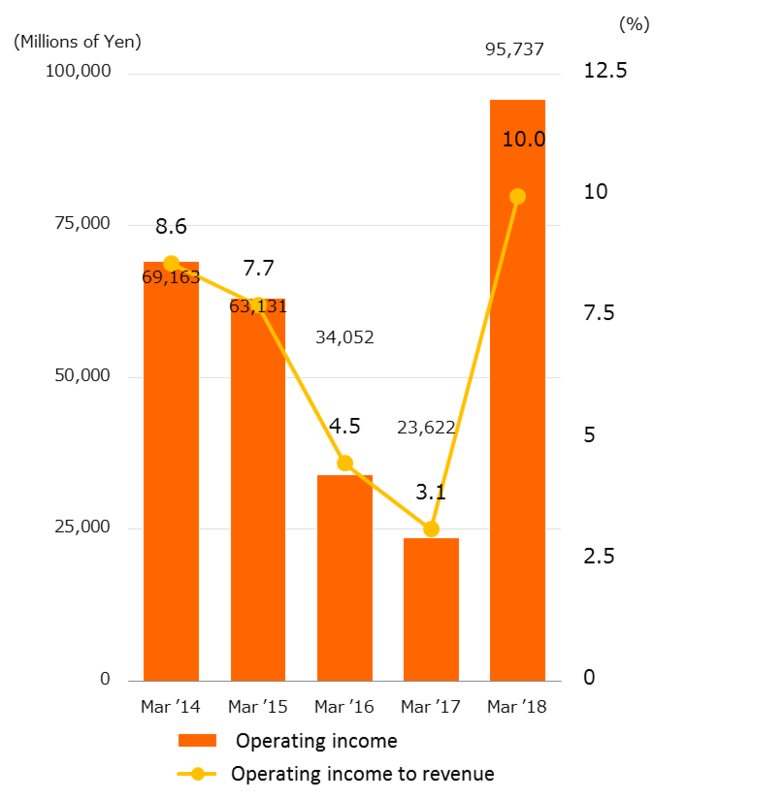 The above adjusted operating income includes a depreciation loss and amortization cost of ¥5,402 million based on purchase price allocation for H-E Parts and Bradken. The above revenues of segments 1 and 2 are figures before inter-segment adjustment.